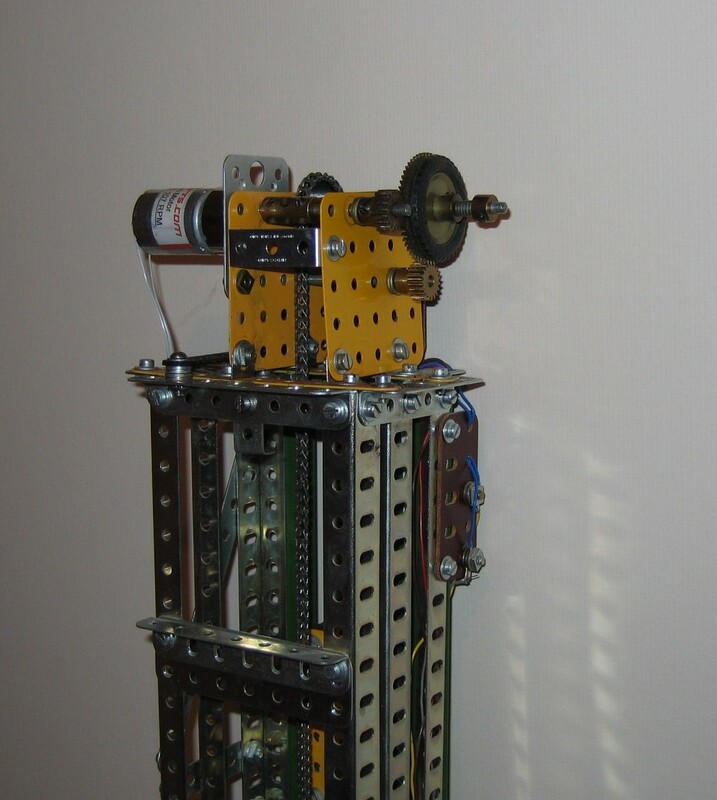 The Model is based on a design by Keith Cameron published in Constructor quartely No 7 march 1990 and is a simple example of the application of the Motorvator. This really complements my tram model as in the latter case this was an example of how the Motorvator could considerably simplify the automatic operation of a model without user intervention, whereas the lift model demonstrates how the Motorvator can considerably simplify a model requiring user intervention. 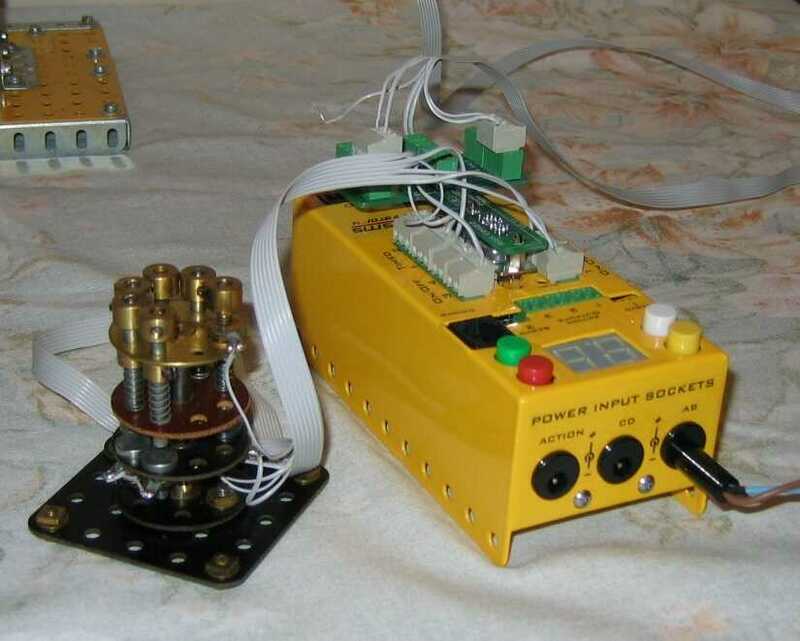 I have seen a lift model wth a very complex circuit involving numerous relays to do the same job. The model is accurate at floor levels to about +- 3mm max.and more usually to +- 2mm. It might be possible to improve on this with further tweaking. The problems are motor overrun , positioning of the rotation counter when it stops and possibly the rotation counter missing a pulse ( I don't think this happens although it might). I have used a Meccanisms 107rpm motor which seems just right for the job. Of course a stepper would give exact positioning and I might modify the model to test this. On the model, selecting ground or 5th floor will re register the position and can always be selected if a sgnificant position error is noticed although in practice I have rarely found an error greater than 4mm. Andrew has suggested that greater accuracy might be obtained by slowing the motor to reduce overun as the lift approaches floor level and I am experimenting with this. 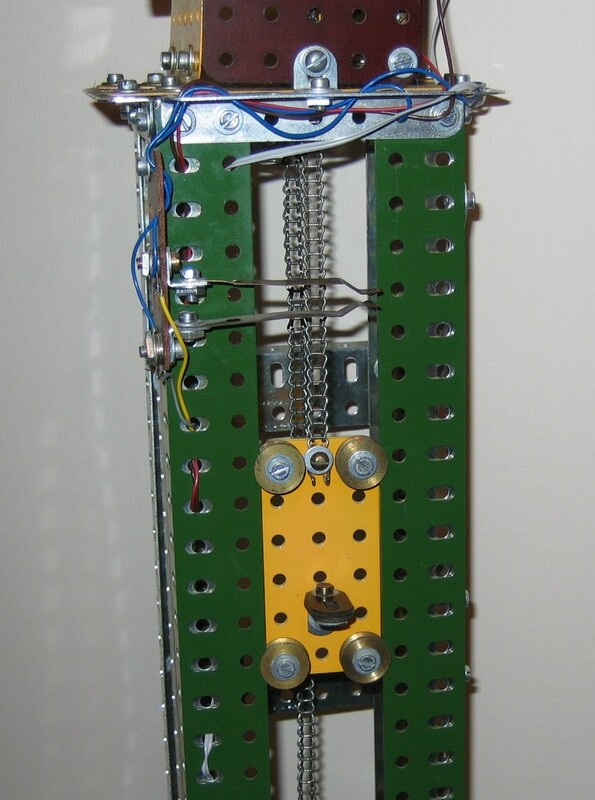 Note that the limit switch in the photo IS the ground floor switch: it is triggered by the counterweight which is of course at the top when the lift car is at the bottom! 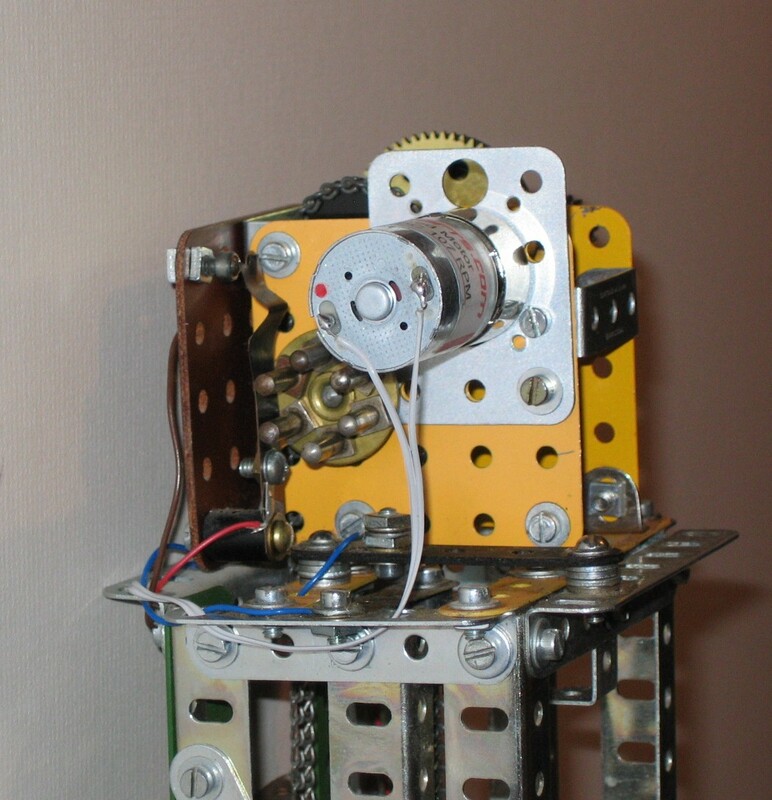 The Consul of lift call buttons is made of standard Meccano and Electrikit parts. the connection to the motorvator is to OnOff 1(two wires), OnOff 2 to 4 (+ive pin only), Timed 1 (centre pin only) and timed 2 (centre pin only). The ground is connected at the consul to all 6 inputs. The inputs from the model are the rotation counter connected by two wires to Timed 4 (ground and centre signal pins), the limit switch for ground and fifth (two switches one connection to timed 3) and the motor connected to motor port B.
I have used the Director socket extension board but I imagine that the Analogue inputs on the Motorvator could be used instead with a small change in the program. As you can see the program consists of a simple loop which tests for a button press for each floor in turn. The Consul could be considered as a model specific "Director" and the idea could be extended to much more complex models. Until finalcount=53 ;In an ideal world this would be 48 but changes were made to allow for motor overun.